These Pet Rescue level 618 cheats and tips will help you beat level 618 of Pet Rescue. The objective of Pet Rescue level 618 is to rescue 8 pets and reach 13,000 points. 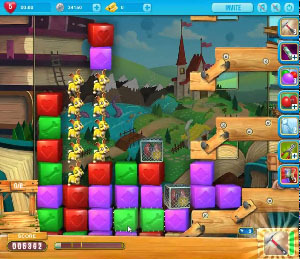 The board in level 618 consists of pets surrounded by locked blocks and a key in the lower left side, normal colored blocks that fill the middle and the top, and three caged line blaster boosters with low timers along the right-most column. Your first course of action will be to free the key so that the locked blocks are cleared from the board and the pets can move down the board. The easiest way to do this is to make a match adjacent to the lowest caged line blaster booster. The timer will set it off immediately, and it will shoot to destroy the block underneath the key so that the key can break and clear the set of locked blocks. With the first set of pets freed from the locked blocks surrounding them, continue to make matches so that the board shifts downwards and reveals a second set of pets surrounded by a second set of locked blocks. By now you might have a block buster booster charged and ready to go, and you can use that to easily clear the block beneath the key. If you don’t have a block buster booster available, you can still use the remaining line blaster boosters to clear the row underneath the key, also freeing the key from its glass confines. Following the second set of locked blocks, bringing the pets to the bottom of the board to be freed is fairly straightforward. There is a third set of locked blocks that block all access to the bottom of the board, and you will need to free the corresponding key on the right side of the board to clear them. Freeing this third key is as easy as using another block buster booster or line blaster booster. After that, your pets will be able to reach the bottom of the board and on to freedom.